The above is my graph for the month of September. The first 54k hands is NL5. The rest is NL25. I collected 13544 VPP which with the Platinum multiplier is worth $610 to me. Also 13.5kVPP is about $135 dollars in stellars. 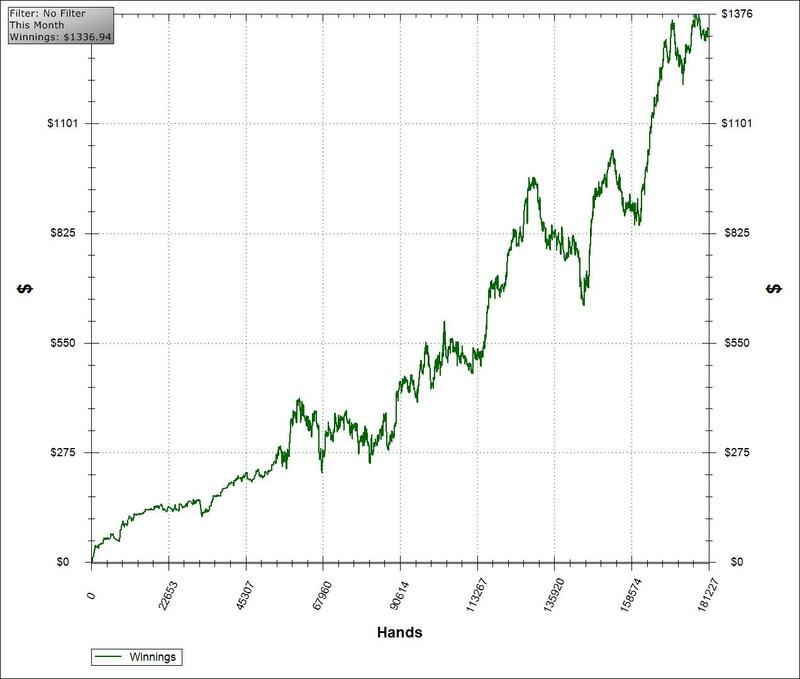 181k hands is pretty low for me. I took quite a few days off early in the month. I need to play a lot more in October. I am being staked so I don't need to stick around at NL25 forever. My winrate was close to 2BB/100 there this month and the game is quite easy to me now. I will play the majority of my hands at NL50 in October. "I collected 13544 VPP which with the Platinum multiplier is worth $610 to me." Just curious, why are these worth a specific amount? How do you cash in your VPPs? Also, Why don't you play on tilt with RakeBack? Also, what is your status on stars? I am going for gold this month. At NL25 there are a lot more regs and there is a lot more 3betting than NL5. There are even a couple light 4bettors. And there are also a few regs who don't just play fit or fold and will float you or bluffraise etc. That said, the game is still fairly easy. It just takes a little while to get used to the differences. Playing NL10 first would probably be a good idea for most people. FTP is only 16 tables, I don't like the software, their customer support was atrocious last I checked and I have had cashout problems with them in the past. I am Platinum on Stars. Looks like you are doing great. Keep it up! Thanks for the encouragement. I see you have playing a ton of hands. How much would you say your tilt control has improved? Has it helped you @25NL? Also, stars just updated their cash bonus. They are instant released the rest of the year. No more grinding additional VPPs to earn them. Anyway, hope to see you at the tables soon. I have never really had a big issue with tilt. I get pretty pissed off when its going really bad but I don't allow it to affect my play too much. I know where my boiling point is and I just insta close the Stars client when I reach it and usually just take the rest of the day off. Good job. Ya they are the best way to spend your FPP's imo if you are not Supernova. Hey, big fan of your blog. I have some questions I hoped you could answer. How many hands per hour do you get per table (and x24)? What do you think the average BB/100 should be for 5NL FR? Do you believe you should aim for it? I think its about 60 hands per table per hour and then 1400 per hour with 24. Well the average BB/100 at NL5 is going to be negative because most people are losing players :p Seriously, just focus on improving and try not to worry too much about your winrate. Anything positive is good. Check PTR top winners if you want an idea of what the top winners are getting. I posted a redline graph just a few posts ago. Hmm pretty interesting. I get 1100 an hour 4 tabling rush on FTP and its pretty easy. I bet you could 6 or 8 table and get upwards of 1800 hands an hour if you switched. Why not? Supernova bonuses? I played a lot on nl5 and i just move up on nl10 last month.My nickname is IRiverBluff, maybe you know me from nl5. I been playing 24 table for just a few month ,but I'm still trying to adapt because i play to loose. I saw on ptr that the average profit on nl5 this year is bigger the average profit from nl10 and I'm just curios if that is the main reason that you skip nl10? I find on nl10 very aggressive players and i can't for now beat this limit and I'm thinking to switch back to nl5 and build my bk for nl25 just like you. Ya I remember you. I haven't really played much NL10 on Stars in years. I am pretty sure it is quite a bit tighter and more aggro than NL5 though. So winrates won't be as high. Keep in mind that NL25 will be harder than NL10 though so it might not be smart to skip it if you are new to poker. My situation is unique, I've played a lot higher than NL10 in the past with success, plus I am being staked now, so I could skip it. how do you manage to play 24 Tables, do you use some auto fold program or something? and table selection.. ? Auto fold is against the rules. I use a bunch of AHK scripts to help multi table. I use the colour coding system mostly to table select.